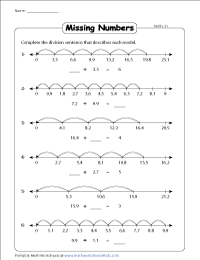 This series of worksheets is meticulously drafted to help students of Grade 5 to learn how to divide decimals using number lines. 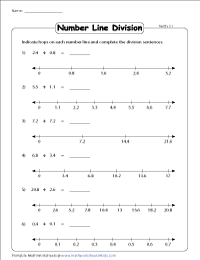 An array of worksheets will require learners to draw hops, write the division sentences, fill in the missing numbers and much more! Observe the number line. 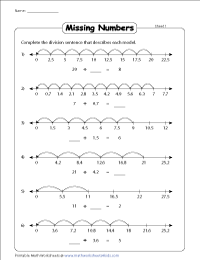 Use the dividend as the starting point and hop backwards on the number line. The number of hops drawn will give you the quotient. 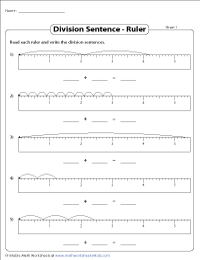 Read and interpret the number line to find the missing divisor, dividend or quotient for each of the division sentences featured here. Use the answer key to check your solutions. Keenly study the number line to identify the interval, number of hops and the starting point. Then, frame the division sentence that best matches the corresponding number line. Hop backwards on the number line to find the quotient. Then, complete the given division sentences. 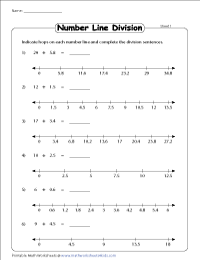 Worksheets are segregated into tenths and hundredths for easy downloads. 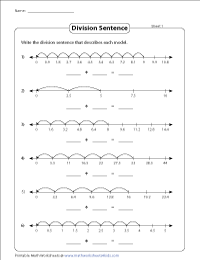 Complete the division sentence that describes each number line model. Both the divisors and dividends are decimals. Based on the interval, number of hops, and starting point observed, write down the division sentence that best represents it. 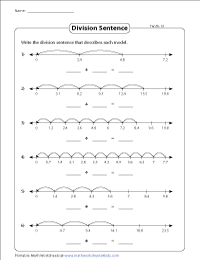 The number lines in this batch of worksheets employs the ruler model. Pay close attention to the markings and frame the division sentences.